Unlimited Free WordPress Migrations From WP Engine, Flywheel, & More! Free migrations are available for all of Kinsta's plans, from Starter to Enterprise, regardless of how many sites you have. Simply sign up for a plan to get started. To take advantage of the free migrations, please reach out to our support team and we'll work with you to gather the necessary information in order to get the process started. Migrations can be tricky and using a third-party plugin might not always be the best way to go. Sometimes this doesn't bring over everything and could result in data loss if you don't know what you're doing. It's much safer to let our expert migration team handle everything. You’ll be notified of your migration status by our team. Moving your site to Kinsta usually won’t incur any downtime, and we’ll help you inspect your migrated site prior to going live. Kinsta's infrastructure was built for high-performance, scaling on demand, and is powered exclusively by Google Cloud Platform. Our migration team moves clients from hosts like WP Engine and Flywheel to Kinsta on a daily basis, and we've seen first-hand that this typically results in substantial speed increases! Whether you're tasking us to migrate five WordPress sites or 50+ sites, they'll take advantage of our isolated container technology. This ensures that all resources are 100% private and not shared between anyone else or even your own sites. Switching hosting providers can be a lot of work. The hours can add up really quick, especially if you’re not familiar with how to properly export and re-import your data. Below is an example of potential savings and time involved if you had to migrate your own WordPress sites. If you don't have the time or capacity, let our expert team do what they do best to ensure a hassle-free and smooth migration. This allows you focus on growing your business. The more WordPress sites you migrate over the more you'll save! * Average hours saved are estimates compiled by our support team. Moving our website to Kinsta from Flywheel was the best decision we've made. From 5-star support to amazing performance (really blazing fast), I recommend Kinsta for anyone serious about growing their business. This offer applies to standard WordPress installations. It is not available for multisite networks or for sites using WP Engine's LargeFS. We will complete your migrations as soon as possible, which could take up to 3 business days. If we believe processing your migrations may take longer we will let you know at the time we receive the request. Sites that change continuously (eCommerce sites, membership sites, etc.) often require the placement of the site into maintenance mode and careful scheduling to avoid data loss. A site that requires maintenance mode or must be scheduled carefully will not be eligible for this offer and should be processed as a normal white-glove migration. Sites that have complex requirements, such as sites that use a reverse proxy, are not good candidates for this service and should be migrated using a white glove migration instead. Redirects that have been added to an .htaccess file or to your prior hosting provider's control panel will not be migrated as part of this service. If you do need to add redirects as part of your migration you can add them using our Redirects tool. Some sites need to be migrated using a 2-step process where there is an initial trial migration followed by a second migration at a later time. The first step in this process, the initial trial migration, can be handled as part of this offer, but the second step when the site is migrated for a second time will incur a fee. If you need a migration for a site that doesn't fit with these requirements you should follow our default white-glove migration process as outlined below. Not using one of the hosting providers above? No worries, all of our plans include one or more free migrations (Starter plans require annual payment to be eligible). 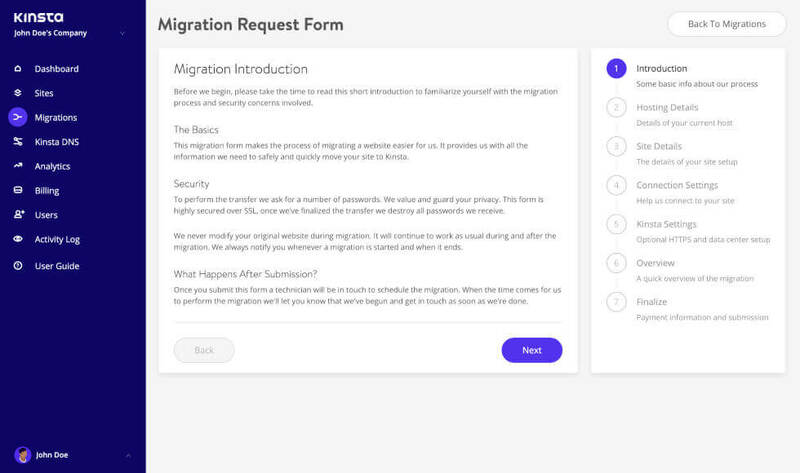 After signing up you’ll be able to request a hands-off migration from our MyKinsta dashboard. We’ll get in touch, discuss the details, and schedule a migration window that works best with your schedule. You’ll be notified of your migration status by our team and you can track the status in our MyKinsta dashboard. To get started simply sign up and fill out our guided WordPress migration form. Choose one of our 20 Google Cloud Platform data centers for your site. Then hand the rest off to us.